If you are looking for a relaxing and easy day in the lake region, then I heartily recommend the Lago Maggiore Express on Lake Maggiore. The trip takes the better part of a day and offers views of both the beauty of Lago Maggiore as well as the foothills of the Swiss and Italian Alps. I always originate my travel on the Express in Stresa, located on the western shore of the lake. The trip can be taken in one of two directions. 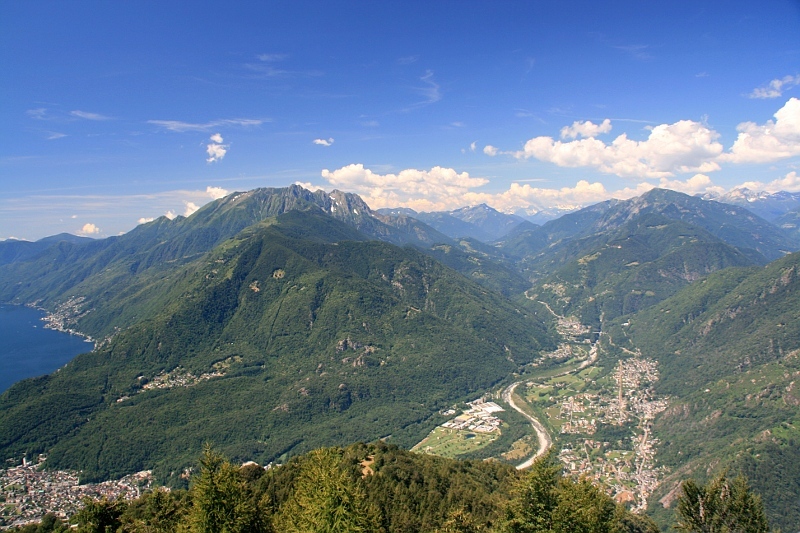 You may start by train from Stresa, take the Centovalli, Lago Maggiore Express train across the foothills to the Swiss city of Locarno, and return by ferry to Stresa. The other option is to start your trip on the ferry from Stresa to Locarno, enjoy lunch on the boat as you travel north and return to Stresa by way of the Lago Maggiore express. I always take the lunch option on the ferry to start the day. You get to enjoy an easy morning in town and get to Stresa’s ferry building by 11:25AM. 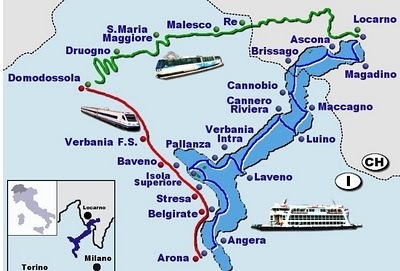 The ferry departs Stresa at 12:00PM Noon. Lunch served on the ferry is generally good food. Don’t expect fancy. The fmeal is served by very attentive wait staff who bring seconds by on a regular basis. There is a supplement for wine or beer consumed. Always request a reservation at a table along the starboard (right) windows of the dining area. This side of the ferry stays mostly in the shade as you travel north toward Switzerland. Upon arrival in Locarno, which is around 3:15PM, you can enjoy about a one hour break between the lake and the train. 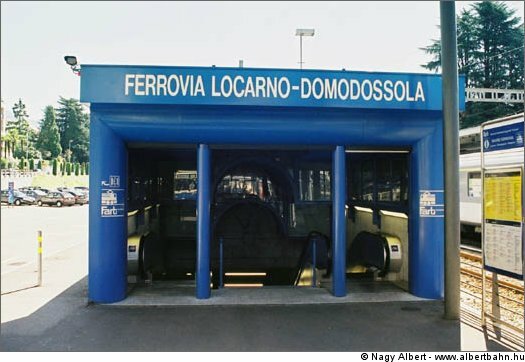 The trains depart from the underground station below the Locarno Main station. The cars always immaculately clean – this is Switzerland, after all – and you can just sit back and enjoy the one hour and twenty minute ride through the foothills of the Alps. Waterfalls, bridges across spectacular ravines, lakes and alpine villages replete with slate roofs abound. 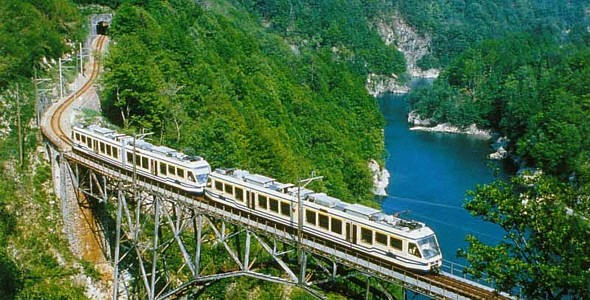 When you arrive in Domodossola, the end point of the narrow gauge train from Locarno, you easily transfer to one of the direct Italian trains that run between Domodossola and Stresa on a regular basis. This is a memorable and easy day in the lake region. Every year, our clients have enjoyed the experience of both good food, an alpine lake and the Alps. Passports are required as you travel between Italy and Switzerland during the trip. It is rare for you to be asked to present your passport, but you must carry it with you for this trip. Truly, a remarkable and easy day in the lake region. Enjoy!